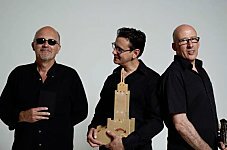 Poetry is given a new voice by South London band LiTTLe MACHiNe, named after Don Paterson’s aphorism: acoustic instruments, strong melodies and watertight harmonies create songs that draw on a thousand years of poetry from the Medieval to the Metaphysicals to the modern. William Carlos Williams, Blake, Shakespeare, Carol Ann Duffy, Carew, Keats, Eliot, Larkin and more … all get the treatment. Poetry is the best words in the best order and LiTTLe MACHiNe have created new music that can move the feet for words that move the soul. Walter Wray has spent a lifetime hollering the blues, crooning tunes and breaking hearts as a solo artist and in bands such as Junk from Sheffield and 90s stadium rock poseurs King Swamp. Steve Halliwell, also in King Swamp, was a session musician in the post-punk world of Shriekback and other arthouse denizens and writes poetry and records music at his Hotel Zulu Studios. Our debut album contains settings of Blake, Shelley, Auden, Carew, Yeats and many more. Order at the LiTTLe MACHiNe shop.